Staff for the new, wired president found themselves without e-mail Monday. 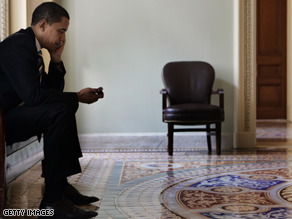 WASHINGTON (CNN) - President Obama has his blackberry — but his tech-savvy press operation has been without e-mail for most of the day, and it’s not yet clear when they’ll get it back. Obama press staffers had just made the leap to their official White House e-mail addresses Monday morning when the Outlook server went down. They weren’t the only ones affected by the crash, which also hit the first lady’s office and other White House offices. An apologetic Press Secretary Robert Gibbs told reporters at 1:30 pm press briefing that the server meltdown was responsible for the delay in responding to their e-mailed questions. But late Monday, nearly six hours since the server first went haywire, staffers still can’t use their official e-mail addresses — and a press aide could not tell CNN when the press office might be able to start sending and receiving messages again. So the mail server "coincidentally" goes down right AFTER the new admin uploads to the new system? Hmmmm....I will reserve comment on this one. Can't microsoft outlook do anything anymore? Sheesh... this is pitiful. Perhaps it is Cheney and Bush fixing the computers... they surely had plenty of time! When will they start posting photos and news releases to the official Whitehouse.gov Briefing Room website? As of yet there are no Pool Reports either? How is this Obama's fault? My god some of you people are just being so stupid! Maybe the Whitehouse should up grade their computer systems. I think that would be a good use of tax payer money. I wonder just how much more hidden Republican incompetence there is we don't know about. At this point, Obama just being able to move into the Whitehouse without the roof leaking and whole electrical system blowing out will seem like a grand victory. this is a tech failure, it happens everywhere!!! it'll be a while untill internet problems can be completly solved. From the High Tech of the Obama campaign into the High Tech of the White House under fromer President Bush is like walking off a cliff into darkness. Lots of upgrades will have to be done and quickly. This is no more Obama's fault than it is Bush's fault. Neither of them work in the IT department of the white house. We are so fortunate to have a very smart staff in the White House. High Tech is a must. Everything will be fixed. I guarantee you this. Uh-Oh, they're onto us, gotta hide, LOL!! I'm playing, i'm playing. This is what they deserve for running that piece of crap called Exchange (not "Outlook server"). Instead of a proprietary and highly unreliable Microsoft product, they should be running a standards-compliant SMTP server. Many companies sell such a thing, or they could get an open source mail server FOR FREE! Hey, new administration... stop wasting tax dollars and STOP PAYING FOR UNRELIABLE MICROSOFT PRODUCTS. Good heavens – it's a technical issue folks – not espionage. And Rick – give Mr. Gibbs a break. Are you telling me that previous press secretaries were calm, cool, and collected on their first days – I THINK NOT. "Senator accuses Pres. Obama of 'environmental thuggery"
You politicians are a bunch of morons and by the way, tell him he better make sure his Sooners better win a title, LOL!! The Obama "pablum" is wearing off. I think the APR, taxes and insurance should be lowered for all home owners. Hopefully the Obama administration is actually technically sophisticated, and realizes full well what a weak link Microsoft anything is, and will set up a Linux and Mac shop. Outsource the exchange server to Rackspace and this will solve everything. What, No backup servers ? Please, who is running the White House IT department. Might be a goos way to loose some critical early emails. You know the ones they wrote before they realized that they were all being logged.